One of the best books on multi-culturism in America I have read. Mr. Takaki is an excellent writer and uses a comparative approach to understand race and culture through the stories of immigrants. I found this book a profoundly moving, profoundly sobering look at the history of our country. It is also a book I couldn't recommend more enthusiastically. In my opinion it is a "must read." I first came across the title on a book table set up by two women who came to NCF to talk about Reba Place's experience with racial reconciliation. I carried the title around with me for a year or two and finally checked it out at the public library. I don't know if I've ever been impacted so strongly by a book before. 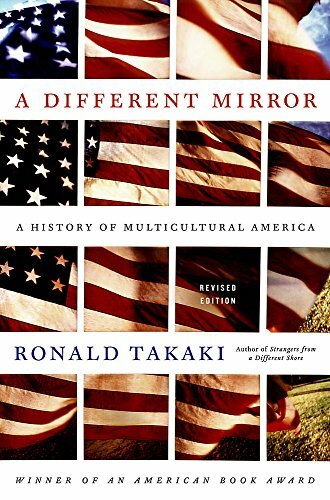 Takaki, a third-generation American (as is my mother) covers American history from the perspective of some of the various minorities that have made America their home, and one that is indigenous. He covers African Americans, Irish Americans, Mexican Americans, Chinese Americans, Native Americans, Japanese Americans, and Jewish Americans from the beginnings of our country to the early 1990s. He evenhandedly paints a picture of the reality of American experience for these different groups. He describes the difficulties they had both on a societal level and on an official government policy level. For those who shudder at the thought of reading through a dry history, never fear. This book is most readable. In fact it is downright engaging. Even eloquent. It is heart-changing. Read it.